Africog, the good governance outfit led by Gladwell Otieno, launched a new Website in Nairobi last Friday called People's Court. The aim of this initiative is to give the people of Kenya an opportunity to find out what happened during the last elections especially with regard to the petitions that were presented or not presented during the Supreme Court hearings. Africog says that many questions still remain unanswered and many statements made during the hearings still remain puzzling even as we await the statement by the judges now coming five days after the deadline given by the justices on the 9th of April. The Website will give Kenyans an opportunity to continue asking these questions, post their answers even if they are speculative, bring forth some evidence which may shed some light on the issue and vent their feelings on an issue which will stay alive in the psyche of Kenyans for a long time to come. Africog made it clear that it accepts the Supreme Court decision as final in the legal sense, but not final in the search for the truth. In other words, after the Court made its pronouncement in a rather casual manner for a matter so weighty, it left Kenyans no other legal option to pursue the matter since the Court is the final port of call for the pursuit of justice in Kenya. But this does not mean its decision was right. Hence, as Bishop Augustine of Hippo once said, "in the court of conscience there is no obligation to obey an unjust law." Likewise, the Africog Website is giving Kenyans, bothered by their conscience on this issue, an opportunity to discuss it and interrogate the court's decision so as to keep the court accountable to the Kenyan people. Speaking during the launch, Maina Kiai drew the attention of the audience to articles 138 and 159 of the Kenyan Constitution. Reading Article 138 which deals with procedure of presidential election, one realizes that the evidence presented at the court showed clearly that this procedure was not followed as laid down in our constitution. For example, it states that "all persons registered as voters for the purpose of parliamentary elections are entitled to vote." The IEBC could not say where the single authoritative register was to tell Kenyans who we could accept as " persons registered as voters" since there were so many different registers apparently used by the Commission in this election. This issue will be further discussed and ventilated upon in the People's Court website. The article further states that "a candidate shall be declared elected as President if the candidate receives (a) more than half of ALL the votes cast in the election". The Constitution which is the fundamental law of the land does not delegitimize spoilt ballot papers since these too can only be designated as "spoilt" because they were legitimately cast by voters. The Supreme Court felt that, in its own wisdom, spoilt ballot papers could not qualify as "votes cast" in this particular election. Maina argued that the Supreme Court seems to have ignored this article. In the face of the evidence produced before it, and more that was available in the affidavit by one petitioner it refused to be tabled--notwithstanding the strong legal reasons justifying the need for the evidence to have been presented--we are led to conclude that the court was wrong to ignore this article. Article 159, dealing with "Judicial Authority" states, among other things, that "justice shall be administered without undue regard to procedural technicalities." If there was to be a case where the weight of this statement should have been given the attention it deserves, it was this case involving the election of the President of Kenya. But apparently this was not to be with regard to the manner in which important evidence was not given a chance to be presented on procedural grounds while the key respondent succeeded in keeping evidence away due to time constraints. Kenyans feel strongly about these issues and the website provides an opportunity to discuss them further so that next time the Supreme Court will realize that Kenyans take their constitution seriously. In any case all the evidence that could have come before the court can now be posted on this website for Kenyans to see what went on during the last election. The IEBC will obviously be held responsible for the many acts of omission and commission. The constitution says, in Article 88, that "there shall be an Independent Electoral and Boundaries Commission". One of the issues that came up several times during the hearings-- and about which Kenyans are very keen--regards whether the IEBC truly exercised its independence during the just concluded elections. But the judiciary could only interrogate the independence of the IEBC if, in the first place, the judiciary itself is truly independent. Some participants at the launch argued that launching the website after the court made its decision would be tantamount to "inciting Kenyans." Maina retorted that Kenyans have a right to search for and speak the truth. Such truth can only irritate the liars. Others argued that "it is now time to move on. Whatever happened during the elections cannot be changed now." Maina responded by noting that if we don't get to know the truth we are bound to make the same mistakes again next time, with the same IEBC. Justice Krieggler warned us after the 2007/2008 electoral debacle that we need to have proper electoral laws, institutions and procedures. We have spent enormous time and money doing exactly that, only to end up making the same or worse mistakes than we did last time. We have to be sadists if we insist on not seeking the truth so that we can make the same mistakes in the future. Yes, indeed, we should move on. But some are asking "moving on to where?" Hopefully the statement that the Supreme Court judges are going to make on Tuesday will help answer this puzzling question coming from Kenyans currently pouring out their frustrations in the social media. Most of them are young people who may lose faith--or have already lost faith--in the electoral process. So the issue cannot simply be reduced to the simple idea of "moving on." The Africog website will provide a venue where a thousand thoughts will contend and a million ideas will bloom so that Kenyans can collectively move on having genuinely come to terms with what happened not out of the tyranny of silence but out of the liberating power of the truth. The African Union Anthem that is also the national anthem for the Republic of Tanzania and South Africa told it all. The East African Community National anthem set the tone of the event. 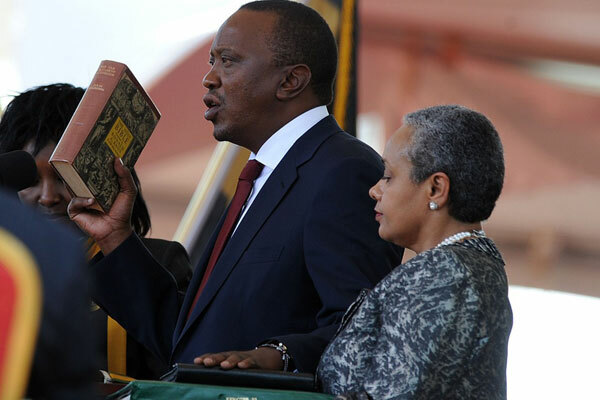 Uhuru’s installation as the fourth president of the Republic of Kenya was no ordinary event. It was a pan African event. To show solidarity with the EAC member states and probably as a sign of commitment to regional integration, the EAC Anthem was played twice, at the beginning and the end. In the midst of the crowd was a grand statesman of Africa, Mzee Kenneth Kaunda, probably the only surviving founding father of the OAU now AU. The now stooping former head of state was a great friend of Jomo Kenyatta and Julius Nyerere. It was therefore fitting that 50 years later, he had to be at the crowning ceremony of the son of his departed friend. Having witnessed power transition in Kenya in 2002 at Uhuru Park, I can say without any fear of contradiction that this was the best power transfer we have seen in a long time. The organizers left nothing to chance. Even the crowd was well controlled despite their excitement from time to time- which was understandable. Though the government invited the entire African continent- 54 heads of state, only 21 of them honored the gesture, among them 11 Heads of State, four countries sent their Vice Presidents while another 5 were represented by Prime Ministers or Heads of Government. Of the Heads of State present, there was Goodluck Jonathan of the Federal Republic of Nigeria and Jacob Zuma of South Africa, the leading super powers of the continent. The East African Community Heads of State, leaders from the Great Lakes Region and IGAD were there in full force confirming that Kenya was an important member of the region. For this reason, it was fitting that Yoweri Museveni, the senior most Head of State in the EAC was accorded the honor to speak on behalf of all Heads of State in the continent. However, there was one unusual guest that must have been a pleasant surprise to those who could recognize him. That was Jesse Jackson, a onetime first African American to run for president in the United States in 1980s and a renowned Civil Rights leader alongside the late Martin Luther King Jr.
As the gathering waited for President Kibaki to arrive; it was interesting to see Uhuru and Ruto informally mingle with dignitaries and make them feel at home. Being first time Head of state and deputy; they were not uptight at all. The incoming First Lady was stunning in her modest way. She looked relaxed beside her husband that would be the Head of State in a matter of minutes. 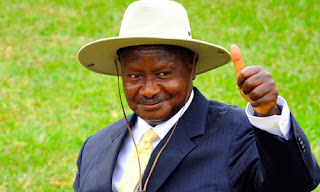 When it was the turn of President Yoweri Museveni to speak, he had the presence of mind to pay tribute to Raila Odinga and Kalonzo Musyoka for helping to maintain peace during and after elections and more importantly to resort to court to resolve the election dispute. He also had kind words for presidents Mwai Kibaki and Daniel arap Moi for the role they had played to ensure Kenya remained peaceful even as civil wars raged in the region. President Museveni did not spare the ICC either. In his personal opinion, the results of the Kenyan elections were a referendum on the ICC. Kenyans defied the impending trials to elect their leaders. As is always characteristic, Museveni left the audience in stitches when he begged Uhuru to stop the Pokots of Kenya from stealing his cows! This was in gesture as he referred to the young Pokot parliamentarian who was detailed to be his chaperon. The speeches by William Ruto and Uhuru Kenyatta were reconciliatory leaving no doubt in anybody’s mind that they were ready to move on and unite the country. On matters of election promises, President Uhuru repeated that indeed within the first 100 days, all Kenyan women would not be charged maternity fees in government hospitals and that come January 2014, all children joining class one in primary schools will all each have a laptop. It was fitting to note that as Museveni, Ruto and Ruto stressed the importance of regional peace, the South Sudan; Somalia and DRC presidents were seated listening keenly. One hoped that they would take the same message back to their home countries. Even though Cardinal Njue prayed for the incoming President and the outgoing Head of State and wished them a prosperous future, His Eminence forgot to pray for the outgoing Prime Minister and Vice President. May be it was a small oversight. However, when President Kibaki rose to give his last speech as Head of State, he paid glowing tribute to his Grand Coalition partners Raila Odinga and Kalonzo Musyoka. The media must have been hugely relieved to hear President Uhuru pledge freedom of opinion and speech as he promised to protect the rights of every Kenyan irrespective of whether one supported and voted for him or not. In conclusion, Uhuru Kenyatta pledged to defend the constitution and to ensure that devolution was implemented to the letter as it was the cornerstone of Kenya’s new constitution. The next 100 days will be a pointer to the direction an Uhuru government will take. Let me begin by thanking all heads of state present and the representatives of heads of state for choosing to be here as a symbol of your continued support and goodwill towards Kenyans. I particularly note, with gratitude, the large presence of our brothers and sisters from across the continent. This is a clear indication of your commitment to the Pan-African agenda. You have bestowed a great honour on me and our country by being here. On behalf of the Kenyan people I welcome all of you to Kenya. Karibuni sana! President Mwai Kibaki, a true statesman and a great leader who over the past 10 years has laid a firm foundation for the future prosperity of our country. Asante sana Mzee. Shukrani nyingi sana. I pay tribute also to former President Moi who is with us today and thank him for his years of leadership and dedication to our nation. Asante Mzee. May he and his fellow architects of liberation in Kenya and Africa as a whole rest in peace in the knowledge that this generation is committed to fulfilling their dreams for our nation and continent. I would like to thank all my worthy opponents in the recently completed presidential election. Every one of you helped define and make stronger our democracy. Because of you, Kenyans had real choices. Because of you, Kenyans felt free to exercise their sovereign will. Thank you all. In an open and free democracy, there is a vital role for a vibrant opposition that helps to hold the Government to account. Kenya is such a democracy, and as President I will respect that role just as I will champion the right of every Kenyan to speak their mind free of fear of reprisal or condemnation. Fellow Kenyans, our nation has now successfully navigated the most complex general election in our history. Our journey began three years ago, with the promulgation of a new constitution, and ended eleven days ago, with a landmark Supreme Court decision. Ours has been an unusual story; an unconventional path. We have been praised and criticized in turn – depending on who was telling our story. Yet while some watched the unfolding national events with skepticism, resigned to what they believed was the inevitability of chaos, others, the vast majority, looked upon our nation with a tempered hope; cheering us on not only because they believed in us but because they knew that if Kenya succeeded they too would succeed. For all that has been said of our nation, the records of history will attest to a number of undeniable facts. They will detail the decisions that the Kenyan media made - the professionalism and responsibility with which they acted. They will remind us of the fact that we embarked on a feat that few other countries have attempted, holding six elections simultaneously. They will call our attention to the fact that the youth were meaningfully engaged in the entire electoral period and that the political consciousness of Kenyans was at an all time high. They will list and honour the individuals, institutions and service organizations that played a strong role in this defining chapter of our nation’s history. They will contrast our accomplishments, with the fact that Kenya ventured into multi-party politics only 20 years ago further strengthening and entrenching our democracy. When the records remind us of these truths, we will recognize that at the end of the day, it is the indomitable spirit of the Kenyan people; their commitment to peace; their desire for progress and their respect for the rule of law - that was the true headline of this election story. Where systems failed, Kenyans did not. Where decisions were delayed and ambiguity prevailed, Kenyans were patient – seeking and waiting for clarity. Where issues arose to stir up dissent, Kenyans exercised restraint; peacefully sought redress and submitted themselves again to the constitution and the rule of law – united in the belief that God’s judgment would guide that of men. Today, I am humbled and honoured to accept the mantle of leadership that the people of Kenya have bestowed on me. I will lead all Kenyans – those who voted for me – and those who voted for our competitors – towards a national prosperity that is firmly rooted in a rich and abiding peace in which unity can ultimately be realized. We will not settle for a perfunctory peace that is disrupted every five years by an election cycle. Rather, we are calling for and working towards a permanent peace, through which democracy is glorified rather than undermined; peace that fosters unity. Indeed, national unity will only be possible if we deal decisively with some of the issues that continue to hinder our progress. It will come through job creation. It will be founded on economic growth. It will be strengthened by a globally competitive education system: by the building of more schools across the nation and by ensuring that we have well thought out curricula that prepares our children for the challenges and opportunities of the 21st century. It will be upheld when all citizens are able to access affordable healthcare and protect themselves, and their children, from preventable diseases that still wage war on our populace. It will be realized when we become a food-secure nation by investing in and modernizing the agricultural sector by equipping it with the relevant information and technology that it needs to grow. Achieving peace and strengthening unity will be the goal of my Government. This work begins now. We welcome all Kenyans to hold us to account. Within the first one hundred days, we will ensure that maternity fees are abolished and that all citizens of Kenya are able to access government dispensaries and health centres free of charge. Within the first one hundred days, we will develop a framework to direct the 6 billion Kenya Shillings previously allocated for the election run-off towards establishing a new Youth and Women Fund that will be open to the youth and women from every part of this country. Within the first one hundred days, we will put measures in place to ensure that all students, joining class one next year, within the public school system receive a laptop. We made a promise to our children and we will keep it because we believe that early exposure to technology will inspire future innovation and be a catalyst for growth and prosperity. Fellow Kenyans, my government will immediately begin the process of supporting devolution and enabling county leadership to carry out their constitutional mandate and fulfill the pledges they made to the Kenyan people. Let us all be clear - supporting devolution is not a choice, as some claim it to be. It is a duty; a constitutional duty. One that I have sworn to uphold; our constitution does not suggest devolution. It demands it. I urge all Kenyans to be persistent, pragmatic, patient and non-partisan as we pursue the promise of devolved governance. Fellow Kenyans, dealing with unemployment will be a priority for my government. We are committed to creating jobs and opportunities for our people - especially our young people. We will do this by creating an enabling environment for the private sector. We will harness the gifts and talents of our youth in order to make sports and entertainment providers of profitable livelihood and to make Kenya a global leader in these areas. We will make the procurement process faster, more accessible and transparent. We will simplify the process of starting and running a business in order to make it friendly and cost-effective to do business in Kenya. We will build on the accomplishments of the last administration in infrastructure by increasing accessibility through roads and rail networks, as well as increasing digital connectivity. To the private sector, my promise to you is that we will create an enabling environment so that you can play your part in creating employment and fostering economic growth. Fellow Kenyans, for too long our nation has exported jobs that should rightly belong to our citizens. We have focused on exporting primary products instead of promoting value addition and manufacturing finished goods thereby creating jobs and improving our standard of living. Today, I pledge that my administration will work towards diversifying our economic base. We will support the manufacturing industry and support all enterprises, both local and international, that strive to create finished goods using local labour and materials. I also pledge that this Government, as the largest buyer of goods and services, will take the lead in supporting local industry by buying Kenyan first. Fellow Kenyans, one of the biggest challenges to national unity is the feeling of exclusion in the decision making process, hence our desire and need for devolution. That notwithstanding, my commitment to Kenya is that our national Government shall and will reflect the true face of Kenya, with the clear understanding that as we bring decision making and services closer to the people, the integrity and solidarity that binds us as citizens of one nation must not only remain but must be strengthened. I am equally committed to ensuring that interests of women and the interests of young people are represented in my government. A department in my office will be dedicated to ensuring that the interests of these groups not only inform every decision I make as President, but also those of every department and government ministry. Fellow Kenyans, to achieve these goals and to achieve Vision 2030, we must be responsible stewards of our natural resources. In light of this, my commitment and the commitment of the Government will be to support the National Land Commission as they seek to provide the land answer. My government will strive to work with all actors to ensure that the issue of land will never again be a contentious or a divisive subject but rather that land will be seen as what it truly is, a factor of production. Fellow Kenyans, we will ensure that the harmony we are striving for extends to the environment. It is our heritage. It is our duty as guardians and custodians of that heritage to protect it for future generations. Indeed, my government will strike a decisive blow against all those that threaten it. My fellow Kenyans, poaching and the destruction of our environment has no future in this country. The responsibility to protect our environment belongs not just to the Government, but to each and every one of us. We will do all this, and more. Where there is uncertainty, we will revive confidence in the government’s ability to protect its citizens. Where there is disillusion, we will restore hope. Where there is opportunity denied, we will open new frontiers, and through our actions we will renew our faith in government as an instrument of good. Let me reiterate that even as we work together to promote inclusion, open new frontiers and create new opportunities, we will not tolerate those who continue to threaten the peace and security of our citizens. Criminals, cattle rustlers, drug barons and agents of terror who disrupt the peace of our society will be met with the full force of the law and the strength of Kenya’s Security Forces. On this matter, we are resolute to our men and women in uniform, I say, this nation is indebted to you. You continue to lay down your lives in service, protecting Kenyans from threats both external and internal. My government will continue to work with you and do all that is in its power to support you as you continue in your noble duty. To our sister countries in the region, we understand that our future is joined to yours. Our peace is linked to the security and stability of the region. As President, I will work with the international community to strengthen its support for IGAD and the AU peace process in Somalia because a stable and prosperous Somalia is in the interest of all nations. My fellow Kenyans, the future of Kenya depends not only on our National Unity but also on deepening our bonds with our brothers and sisters in East Africa and Africa as a whole. It is with this unity that we will prosper and truly deliver on the promise of independence and liberation from our colonial past. My administration is therefore committed to regional trade and cooperation and will continue to strengthen ties through the free movement of people, goods and investment, including the removal of tariff and non-tariff barriers to trade within the EAC. My goal is to see the continued growth of our community towards ultimate integration. Africa, ladies and gentlemen, is on the rise. Kenya sees herself as an integral part of this exciting awakening. The great renaissance spoken of a mere 20 years ago is upon us. Across the continent, evidence of renewal and growth is everywhere, built on the bedrock of rising self-confidence, a growing educated, youthful population and God given abundance of natural wealth and resources. To the Nations of Africa and The Africa Union, we assure you that in Kenya, you will continue to have a partner and an ally. If we stand together in solidarity I am confident that we will find the strength to thrive and innovate solutions that work for us. Of course, we join you in continuing to insist on relating with all nations as equals, not juniors. As partners, not subordinates. In our history as nations, we have seen some of the most ardent promoters of ideals of national sovereignty and democracy sometimes fail to live by the principles they espouse, but let us remember that their failure does not justify ours. To the nations of the world, we acknowledge that in this age of globalization, all of us are interdependent. Our economies are interconnected as indeed are our people. I pledge to continue cultivating the relationships we have had with our traditional partners and I say to all developing and developed nations who desire a deeper and more mutually beneficial relationship with Kenya: we are ready for partnerships, we are open for business and we invite you to invest in our country. I also want to remind the International Community that for the last 50 years, Kenya has been one of the most engaged members and one of the most prolific co-authors of international treaties and instruments. Central to our continued contribution to the international community, will be the understanding that the world is made up of many countries, cultures, political experiences and world-views. We must remember that no one country or group of countries should have control or monopoly on international institutions or the interpretation of international treaties. While each state has a right to its own view, it must respect the fact that it holds just one view amongst many in the community of nations. Fellow Kenyans, today work begins. The time has come, not to ask what community we come from but rather what dreams we share. The time has come not to ask what political party we belong to but rather what partnerships we can build. The time has come to ask not who we voted for, but what future we are devoted to. Fellow Kenyans, we must move forward together. Let us remember that although we may not be bound together by ethnicity, or cultural practices or religious conviction – our kinship rests solidly upon the fact that we have all been adopted by Kenya’s borders; we are all children of this nation, we are all bound to one constitution which calls us to rise above our individual ideologies and march to our national anthem. Brothers and sisters; fellow Kenyans, let us move forward, together, in the spirit of our anthem and in the spirit of our constitution being confident that if we turn neither to the left nor to the right of our national values, we, as a people, will see the promised land of prosperity that our forebearers set out for. The Kenyan tax payers are a very unlucky lot. They will never get it right with their elected leaders. Despite voting massively to remove one lot after another since the 9th parliament, any set of MPs they bring in will as if programmed, instantly resort to plotting how to fleece the treasury. How come since we changed Moi’s regime in 2002, we have been electing a hungry and greedy set of leaders to our parliament? How come that during the 10th parliament, only Johnson Muthama saw the need to pay his taxes yet even the Speaker of the National Assembly who pocketed more money than Muthama avoided taxation like a plague? Is there a chance that we can amend the constitution to elect Kenyans who are ready to serve the country as volunteers because in life, they have made their wealth elsewhere? Or better still, can we peg elected leaders to their level of education and pay them in line with civil servants and other public servants? Why pay a Form Four school dropout the same salary as a professor just because both are MPs? As a Kenyan, I have been thoroughly embarrassed to see that our newly elected members of parliament and county clamoring for more pay even before they perform an honest task for a single day. It is hurting to see those who were youth wingers and personal messengers of MPs just the other day clamoring for more money than the 79K they have been awarded as county reps. Suddenly they want to live in posh areas of Nairobi where rents are in the scale of 80K and above per month. If indeed the 79K they are being paid cannot meet their monthly expenses, how did they manage their lives all these years? Did they live on trees and ate herbs and rats for a living all these years? What has suddenly happened to the public schools and hospitals they used to go to? Were they elected to serve Kenyans or to lead lavish lifestyles? It is this same lavish lifestyle that angered Kenyans so much when the 10th parliament was hell bent on ripping the treasury of 2 billion shillings as golden handshake before parliament was dissolved. The wrath of the Kenyan voter sent 180 of them packing thinking that all would be well with the new people’s representatives. We were wrong again. There is nothing intrinsically wrong with county reps, governors, MPs and senators asking for a decent pay to cater for their needs. However, they must remember how the rest of the 40 million Kenyans live, some of who may not even afford a dollar a day. If you doubt me, travel to Lokichogio, Turkana, West Pokot and even parts of Central Province and Nyanza where abject poverty is still king. The money they are looking for must come from somewhere. Someone must have worked for it. Our treasury is not a bottomless pit. Our taxes cannot merely be levied to lavish a few elected leaders who have done nothing for this country. When the economy improves, the issue can be revisited. Until then, they can do well to shut up for awhile and focus on the job that took them to parliament or county assembly. I can understand if former MPs and cabinet ministers who used to earn 1000k a month have had their salaries as governors, senators and MPs slashed to just over 500k. Obviously they will need some adjusting to do. However, this Salary Remuneration Commission rationalization did not come as a surprise to them. They knew all along that public service wage bill had run amok, thanks to the greed of the 10th parliament that led the pack. To tell you the truth, frequent upward adjustment of salaries for MPs, Ministers and Permanent Secretaries, sometimes without any justification was the reason we had so many wild cat labour strikes in Kenya in the last five years. If teachers were not on the streets, professors, doctors and nurses were carrying placards demanding haki yao. If civil servants were not downing their tools, the police were grumbling and engaging in go slow protests. It was because they could not understand why they should take home 10k per month while MPs who worked three days a week took home 1000k a month! There is too much wastage in public service. The other day I saw a newspaper report that alleged that the public service spends over Ks 4 billion in tea and flowers in one year. One wonders what Ks 4 billion would do to the people of Turkana who are perpetually in abject poverty. What would happen if there was a freeze in the buying of flowers and tea for public service workers for just one year? This country needs more super highways not just Thika Highway. We need working modern railway and commuter buses in cities like Nairobi, Mombasa and Kisumu. We need security, food sufficiency, healthcare, better classrooms, books, laptops and enough teachers for our schools. We need more trained doctors, nurses, lab technicians, medical equipment and medicines for our hospitals and clinics. Kenyans are dying in their thousands due to the inadequacy of the police force to man traffic on our roads or simply to shield us from external terrorist attacks. We need more money to train and deploy more police officers, buy faster moving police vehicles to properly keep surveillance on our highways and net criminals before they plant bombs in our cities. We need cash to manage perennial floods! We need more money to provide universal healthcare for all Kenyans at home and abroad. This universal healthcare will make Kenya a healthy and productive nation. The more reason we cannot waste our limited resources on a group of people whose output has always been difficult to quantify. Your article, REFLECTING ON RAILA'S LEGACY was candidly honest. I was uncomfortable with the heavy parallel's you drew between Raila and Jesus Christ. I know you appreciate that faith is a deeply personal matter. I don't think that Jesus Christ should be compared to any mortal. Nelson Mandela, Martin Luther King Jr - nobody fits the bill. Incidentally, I think this is one mistake Raila has made early in his reflections, or strategy for a comeback. His meet-the-people tour of Kisumu was loaded with comparison of himself to Jesus Christ. That might have been music to his base, but to rest us who admire the man's courage and hail him as a hero - in the same league with James Orengo, Gitobu Imanyara, John Khaminwa, Paul Muite, the late Martin Shikuku - the real heroes of the democracy we enjoy today, but who hesitate to go along with him because of the unknown element about what he would do if he became president, we get more apprehensive about what appears to be his entitlement belief. I was convinced, upto early Feb, that there was no way Uhuru would defeat Raila. I think, really that Raila would have taken at least half of the Kalenjin votes, but he destroyed his chances. By taking on Ruto at a very low level - calling him thief, he [Raila] alienated himself from the Kalenjin. Because you know in Kenya, when you claim that Raila has not developed Kibera, the Luo take it to mean that you are castigating the whole of them, that they are not development conscious. When Raila, in his analogies, talks about a snake in the house on the hill and talks about how they will suppress it - you hold the head, and you hold the tail, I will hold the mouth (to paralyze the snake?) the Kikuyus take it that if he can do that to Mwai Kibaki, he can do it to the whole lot of them. When Raila's kitendawili talks of a madman who took off his clothes and then fell asleep barabarani, the kikuyus take it he is not only demeaning Uhuru, he is demeaning the whole lot of them. So, when Raila took on Ruto as a thief, the whole Kalenjin community saw itself in the dock. I am pretty convinced that the Kalenjin, in their hearts, prefer Raila far more than Uhuru. They have issues with the Kikuyus, which remain unresolved. 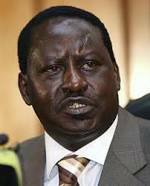 But Raila did not conduct himself as a statesman in their eyes. He was sucked into petty name calling - the league of Kajwang and Muthama. If you remember Kibaki's campaigns in 2007, he never attacked Raila at a personal level, or malign the Luo. I don't think he [Kibaki] garnered a lot of support across the country in 2007. His campaign lacked focus, was uninspiring, uncordinated - but you can't take it away from him, that he was a statesman, harbouring no ill-will towards communities opposed to him. That is what Raila misses. He shouldn't conduct himself as another politician. He must cultivate the image of a statesman. Can he make a successful comeback? Seems to be a tall order. In 5 years time, there will a new crop of voters who know nothing about his heroism. Secondly, I bet that his chief allies - Nyong'o, Midiwo, Kajwang, and possibly Orengo will fall at the ballot in 2017. That will greatly weaken his candidature if he decides to contest. Thirdly, if the Jubilee coalition holds, and if Uhuru and Ruto overcome their woes at the Hague, it will be a very tall order to defeat them. I am sure you saw from the registration figures that the Kalenjin did not come out in big mumbers to register. The highest Kalenjin county [Kericho] had 82% of projected figure (Nakuru, 93.1% is mixed, more Kikuyu. Compare that with Kiambu, 113%. If the Kalenjin turn in massive registration in 2017, it will be virtually impossible to beat Uhuruto ticket, if the stick together. Of course they will again count on support from sections of Kisii, Maasai, Pokot, NE, and hopefully then, Turkana. Seems to me Raila's comeback might run into very strong head-winds. Back to where I started. I found your article to be candid, honest. Since the rather surprising announcement by the Supreme Court judges on the disputed presidential elections, a substantial number of the Kenyan people sank into depression. A man committed suicide in Migori County. Another Digo man called me from Ukunda in Kwale County wondering whether it was still worth retaining his voting card. A young lady from Nyeri came to my office saying she needed some money to board a matatu and go to Naivasha where the governors are meeting: she wanted to go and encourage them to defend devolution with all their might. "After all," she argued, "this is the only level of government which now interests me." Let us give this lady a place to feel at home in the county of her choice. (c) the Judiciary and Independent Tribunals. So we have two levels of government within the state of Kenya, each one of which must complement the other within the framework of the constitution. The current division among Kenyans following yet another electoral debacle is obviously unhealthy, and has already led to the feeling by the aggrieved that they need to seek refuge into the counties since executive power of the national government has twice been illegitimately constituted. The so-called victors have, in the meantime, opened war against the counties, justifying it under the winner-take-all mentality which will remain a grave danger to any present and future nation-building initiatives. So what do we do? Last Sunday I proposed a parliamentary system of government, proportional representation and compulsory voting of all over 18 as a practical solution to both our electoral problem and nation building crisis. This debate should be carried out so that sooner rather than later a referendum can be held for Kenyans to pronounce their stand on it. Today, however, I want to tackle the current problem: the top dog/under dog mentality that has emerged in this country because of a bad electoral system which allows those in power to use state apparatus to mess up with the electoral process in order to produce predetermined results. Whether we like it or not, this is what has led us to the crises in Presidential elections every time they have been held since independence. The true test of a democratic election is that, when it is over, the victors should celebrate their victory while the losers accept the outcome as legitimate. For this to happen, the electoral process itself must be credible, acceptable, transparent and not subject to any manipulation by any party. The depression that has hit the over five million voters for the petitioners in the recent election comes from the fact that they cannot accept the outcome as legitimate since there were glaring pitfalls in the process, more than obvious manipulation of the vote tallying to predetermine the outcome and an unconvincing explanation by the judges as to why they came to their conclusion. What makes the depression so profound is the abuse of the tremendous faith Kenyans had placed in the two institutions: the IEBC and the Supreme Court. The result is a search for a refuge which is currently expressed by an urge to withdraw into the county, the other level of government, where one might feel at home having been disappointed by things at the top. These are real and tangible human reactions which we should not wish away if we are still committed to the Kenyan nation-building project. My proposal is the following. One, let us not pretend that all is well at the top; and that Kenyans are prepared to "move on". The nation is probably divided currently into two equally powerful social forces. The "movers on" group celebrating the assumption of power by the Jubilee Alliance; and the "wait, let's solve the problem" group deeply hurt by the electoral debacle. Can you possibly build a nation while ignoring this deep division among us? My take is that you cannot. While the Bomas process brought us the new constitution with tremendous gains like devolution, another process is now necessary to take us beyond the authoritarian presidency--the love of which leads us to such divisions--to a people's democracy through which the nation will be built. Two, let us accept that as long as such deep divisions exist in our society, development will remain elusive. We may achieve tremendous economic growth with sky scrapers donning the skyline of our cities, but we will not have the human souls to integrate these human achievements with human joy and happiness. I am already seeing it in public places where people don't really socialize; they spend more time scrutinizing their surroundings before they can settle down to socialize in some way. This is obviously not healthy: it smells of a creeping neo-fascist culture. Development will remain elusive because development entails people believing and trusting in institutions of governance, and then being inspired to action for the national good. "The constitution guarantees equal protection of the law for everyone. It therefore demands that justice must be done to all irrespective of status. It also demands that all state organs must assure access to justice for all persons...These twin constitutional demands...require that justice be delivered expeditiously and without regard to technicalities." To what extent have the justices been faithful to their declared public policy? The pain of seeking an answer to this question is the cause of serious depression currently among Kenyans and the fear of their loss of faith in institutions key to the Kenyan nation building project such as the Supreme Court.